Connecticut boosts numerous wedding venues that provide couples with gorgeous outdoor views. A Waveny House Wedding is among those venues. The mansion was built in the 1900s in the style of the Tudors and has become a popular site for weddings. With a Waveny House Wedding, couples may take advantage of the splendor of the house as well as the extensive grounds surrounding the mansion. The house is set in the center of 250 acres of lush green parks that are maintained by the New Canaan Recreation Department and give guests a view to remember. In addition to the parks, flagstone walkways take those who attend to the mansion’s Walled Garden, a spot often used for small ceremonies. This venue is especially beautiful in the spring, which is when the bride and groom pictured were wed. I enjoy taking portraits of couples that allow them to take some quiet moments to reflect and simply be with one another on their special day. This photograph finds the bride and groom alone in the vast outdoor space provided by the parks. The night sky, the rolling mountains in the background, and the majesty of the tree they stand below makes it seem as though they are the only two humans for miles. 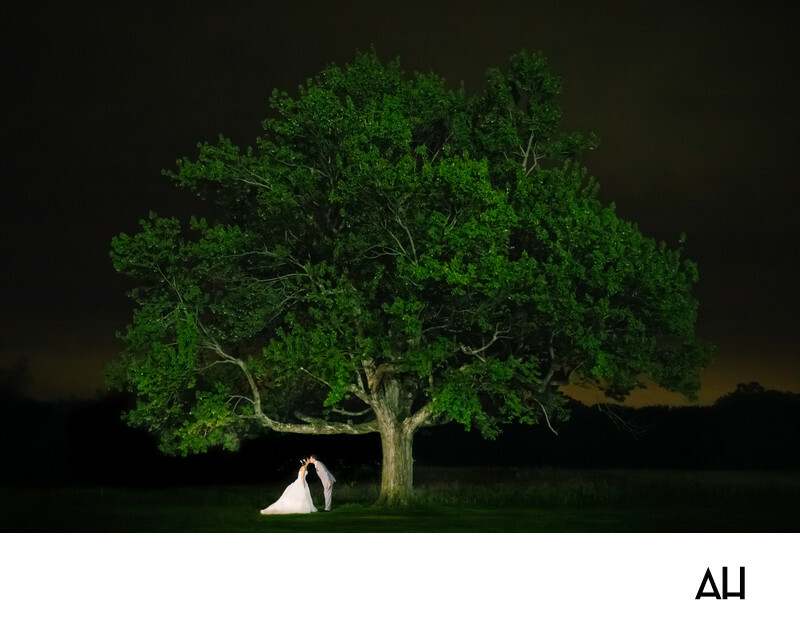 To add to this illusion, I used an off-camera light to highlight the newlyweds. The white of the bride’s dress and the pale coloring of the groom’s suit make the pair glow even more brightly in darkness.